If a young and unmarried criminal lawyer falls to the charms of a beautiful female convict who is under trial on the grave charge of a cold-blooded murder, what’s he expected to do ? Quite naturally, he will leave no stone unturned in defending her in the court and get her exonerated. 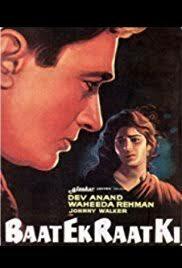 And that’s the story of this black and white suspense thriller starring Dev Anand and Waheeda Rehman which was released in 1962. 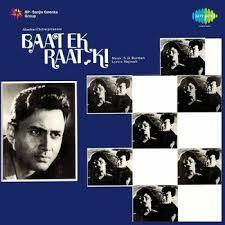 Baat Ek Raat Ki (the tale of a night) starts quite interestingly with the murder of a stage actor, Ranjan (Chandrashekhar) at the residence of Neela (Waheeda Rehman) in the darkness of the night. Before the titles start, it is shown that just after the sound of the gunshot, someone comes out of the house and while running in the dark, he collides with a blind beggar. Anyway, Neela who is a renowned stage actress, is arrested for the murder and she confesses it too. But when she, being in police custody, tries to commit suicide, our hero, Rajesh (Dev Anand) arrives on the scene and saves her life. While registering his statement in this regard in the police station the next morning, Rajesh who is a criminal lawyer, happens to meet Neela’s wailing mother and through her comes to know of Neela’s turning into a renowned stage actress from an ordinary girl, dancing in public to earn a living for herself and her family members. He gets Neela released from the police custody on his responsibility under the pretext of the doctor’s advice (to improve her mental condition) but actually for digging out the whole background of the murder from the horse’s mouth itself and thus helping the police in preparing a solid case against her in the court. However he falls in love with the extremely beautiful damsel. Then starts his bid to prove her innocence and get her exonerated and finally he succeeds in exposing the real murderer. Director Shankar Mukherjee has directed this movie ably and presented a good mix of romance, emotions and drama in this murder mystery. Despite its flaws, it provides a nice entertainment to the viewer. Though the viewer can guess who the murderer is, still his curiosity is not diluted and that’s the success of the screenplay writer and the director. The final court-room scene in which both the murderer as well as Dev Anand are in disguise, is highly interesting. Though normally disguises in Indian movies are so poor that the audience can easily identify the character behind the disguise, yet this movie is an exception in this regard. Technically and cinematographically this B &W movie is all right. However editing is not up to the mark. Perhaps the length of the movie has been decided to follow the relevant norm in that period, else it could have been trimmed very easily by at least 15-20 minutes. 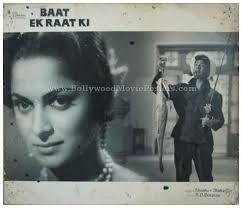 I consider Waheeda Rehman as one of the greatest actresses of the Indian silver screen. And in this movie too, she has portrayed the loneliness and stuffiness of the girl going from rags to riches, with a high degree of proficiency. She is in double role too (playing Neela’s younger sister also). Though she’s said to be very close to Guru Dutt in personal and professional life, in my opinion, her best on-screen chemistry was with Dev Anand, the stylish, dashing and mannerismic Indian Gregory Pack. He has also done satisfactorily. The supporting cast is ok. Johnny Walker has done good comedy. S.D. Burman has composed admirable music for the songs whose lyrics have been written by Majrooh Sultanpuri. The best song is inarguably – Na Tum Hamen Jaano Na Hum Tumhen Jaanein sung separately by Hemant Kumar and Suman Kalyanpur. Other songs – Akela Hoon Main Iss Duniya Mein Koi Saathi Hai To Mera Saaya (Rafi), Jo Hain Deewane Pyar Ke (Rafi-Asha), Jo Ijaazat Ho To Ek Baat Kahoon (Rafi-Asha), Sheeshe Ka Ho Ya Patthar Ka Dil (Rafi-Lata), Arre Kisne Chilman Se Mara (Manna Dey) etc. are also quite good to listen. Background score is also in line with the mystery genre of the movie. 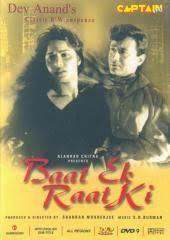 Baat Ek Raat Ki is not an excellent movie. However it is definitely a nice timepass. 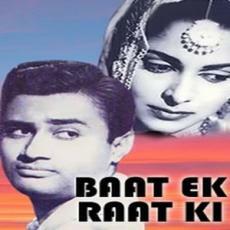 Whether you are a mystery fan or fond of social dramas or like romantic musicals, Baat Ek Raat Ki will live up to your expectation. 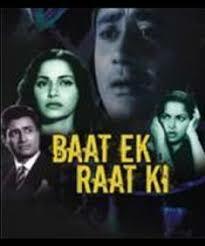 This entry was posted in Movie Review and tagged Akela Hoon Main Iss Duniya Mein Koi Saathi Hai To Mera Saaya, Arre Kisne Chilman Se Mara, Dev Anand, Indian Gregory Pack, Jo Hain Deewane Pyar Ke, Jo Ijaazat Ho To Ek Baat Kahoon, Movie Review - Baat Ek Raat Ki (1962), murder mystery, Na Tum Hamen Jaano Na Hum Tumhen Jaanein, Shankar Mukherjee, Sheeshe Ka Ho Ya Patthar Ka Di, suspense thriller, Waheeda Rehman. Bookmark the permalink. Thanks Rajeev Ji. Yes, it’s an interesting watch.